PORTLAND, Ore. – March 25, 2010 – In preparation for the 2010 Major League Soccer season, adidas has unveiled TECHFIT uniforms for three of the sixteen teams. For the first time ever, members of Chicago Fire, D.C. United and LA Galaxy will have the option of wearing adidas TECHFIT PowerWeb uniforms on the pitch this season. Until recently, TECHFIT PowerWeb has been more commonly worn under a player’s uniform as compression apparel; but the new adidas MLS uniforms offer TECHFIT built into the actual jersey giving players the benefits of TECHFIT in a single layer. TECHFIT PowerWeb is a cutting edge athletic apparel technology that improves muscular endurance and responsiveness, and reduces muscle vibration, ultimately maximizing the athlete’s performance. Through the use of compression fabrics and strategically placed TPU (Thermoplastic Urethane) bands, located in key areas to enhance muscle power, TECHFIT is proven to increase a player’s power by 5.3 percent*, vertical leap by 4 percent*, sprint speed by 1.1 percent* and enhance endurance by 0.8 percent*. The TECHFIT jersey as worn by the players on the pitch will be specially packaged and retail for $150 starting in July. All other MLS teams will wear the adidas FORMOTION uniform. FORMOTION is engineered to move naturally with the athlete’s body resulting in an ideal fit and comfort while in motion. It also features adidas CLIMACOOL technology which combines a moisture wicking fabric and mesh construction in the player’s highest heat zones to improve body ventilation and keep the athlete at optimum temperature. The FORMOTION uniform is designed to partner with traditional TECHFIT PowerWeb compression apparel. 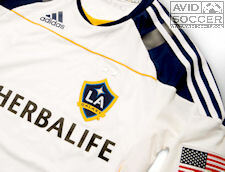 adidas, the number one soccer brand in the world, is the official athletic sponsor and licensed product supplier to MLS. adidas TECHFIT PowerWeb uniforms will also be worn this summer at the 2010 FIFA World Cup. adidas will outfit 12 federations at the 2010 FIFA World Cup – more than any other brand – with the ultimate in personalized soccer uniform kits. Federations with the option of TECHFIT uniforms include South Africa, Argentina, Mexico, Japan, Spain, Germany and France. While we at AVID Soccer cannot substantiate the performance claims, they do seem reasonable. The most dramatic example of this was the Speedo swimsuits worn in the last Summer Games The reduced vibration will not have the same effect in the air that it does in the water, but it will focus the players energy. From personal observation, we have found that compression clothing not only helps with endurance, but improves recovery. * Proven research from adidas Global Research and the University of Calgary.